Recent technological progress permits robots to actively and safely share a common workspace with humans. Europe currently leads the robotic market for safety-certified robots, by enabling robots to react to unintentional contacts. AnDy leverages these technologies and strengthens European leadership by endowing robots with the ability to control physical collaboration through intentional interaction. To achieve this interaction, AnDy relies on three technological and scientific breakthroughs. First, AnDy will innovate the way of measuring human whole-body motions by developing the wearable AnDySuit, which tracks motions and records forces. 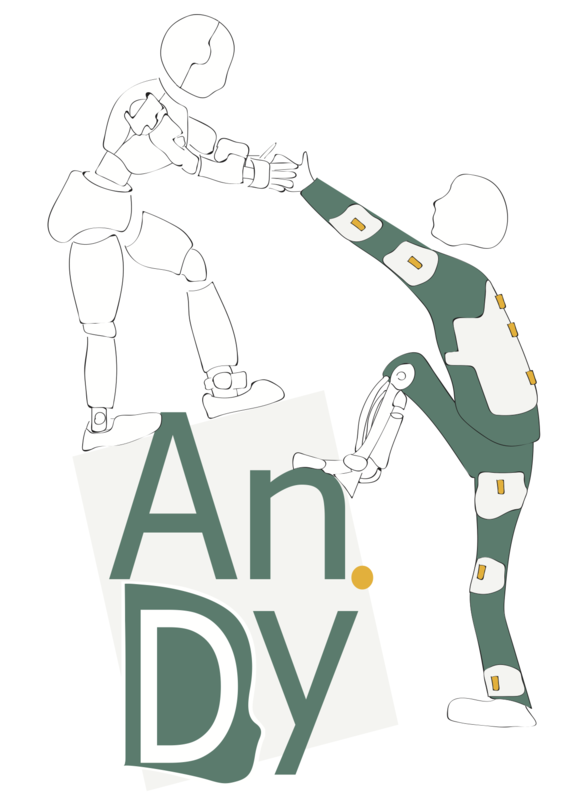 Second, AnDy will develop the AnDyModel, which combines ergonomic models with cognitive predictive models of human dynamic behavior in collaborative tasks, which are learned from data acquired with the AnDySuit. Third, AnDy will propose the AnDyControl, an innovative technology for assisting humans through predictive physical control, based on AnDyModel. By measuring and modeling human whole-body dynamics, AnDy provides robots with an entirely new level of awareness about human intentions and ergonomy. By incorporating this awareness on-line in the robot's controllers, AnDy paves the way for novel applications of physical human-robot collaboration in manufacturing, health-care, and assisted living. AnDy will accelerate take-up and deployment in these domains by validating its progress in several realistic scenarios. In the first validation scenario, the robot is an industrial collaborative robot, which tailors its controllers to individual workers to improve ergonomy. In the second scenario, the robot is an assistive exoskeleton which optimizes human comfort by reducing physical stress. In the third validation scenario, the robot is a humanoid, which offers assistance to a human while maintaining the balance of both. My talk @TUeHTSC hosted by @alecksbigbag was really a lot of fun. Past (@IITalk , @DIC_LAB_IIT) and present (@DeepMindAI). Working on combing my background in robotics and my present in AI for achieving major breakthrough. I am glad to present at @TUeHTSC the research in robotics at @DeepMindAI.